April 15th 2016 marks 104 years since the Titanic sank on its maiden voyage from Southampton, England to New York, United States. An event that shocked the world over and inspired decades of searches for its wreckage and the treasures she concealed. In commemoration, Soboba Casino is bringing the memory of the Titanic back to the forefront with their month long celebration of both the mystery and majesty of this historical ship. 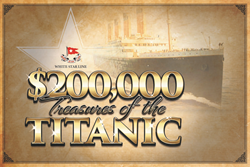 In April, guests will have a chance to participate in the “$200,000 Treasures of the Titanic” drawing where they can win their share of $200,000 in cash, free slot play, and prizes. One winner will be drawn every half hour on select days from 4 PM until 9 PM to come aboard and try their luck on the Treasures of the Titanic Game Wheel! To participate, guests must earn 50 points in April, then swipe their Club Soboba card at any kiosk, and select the “$200,000 Treasures of the Titanic” icon to enter for the chance to win. In addition, Soboba will also be kicking off the “Unsinkable Slot Tournament” starting April 1st. Guests who earn 2,000 points during the qualifying periods can register to compete in the Unsinkable Slot Tournament each Thursday in April for a chance to win their share of $47,500 in Free Slot Play and prizes. That’s just the tip of the iceberg however, because Soboba has much more in store this April. For the first time ever, Soboba Casino has procured authentic artifacts from the historic Titanic. These unique items were salvaged in the 1994 Research and Recovery Expedition and certified and authenticated by R.M.S. Titanic Inc. VIP guests and select winners will take home their own piece of nautical history. In culmination of the month long voyage to the past, Soboba will also welcome Celine Dion tribute artist and Las Vegas headliner, Morgane Latouche, on April 30th live in AC’s Lounge. Morgane is well known for bringing the heart and soul of the Titanic to life with her touching rendition of the 1997 film “Titanic” theme song. Tickets go on sale April 4th, 2016 for $25 each, and the show starts at 9 PM on April 30th. In conclusion, if the full Titanic experience didn’t feel quite complete there, Soboba will also be welcoming their own “Rose” and “Jack,” the main characters of the 1997 blockbuster film “Titanic” who will be portrayed by Leonardo DiCaprio and Kate Winslet look-a-likes. They will be in the casino’s Banquet Room on April 30th where guests will have the opportunity to take photographs with the duo in the casino’s Titanic photo booth free of charge with Club Soboba membership. Soboba Casino is proudly owned and operated by the Soboba Band of Luiseno Indians. Come join us for all the fun and then some! Soboba Casino. Where Everybody Goes to Play!